Since upgraded to Windows 7 from windows Vista, my rapidshare downloader JDownloader seems to have problems starting itself properly. Executing JDownloader.exe will leave your system running javaw*32.exe (simply because JDownloader was written in Java) forever and you won’t see the main user interface starting up at all. I later found out that it has something to do with UAC. 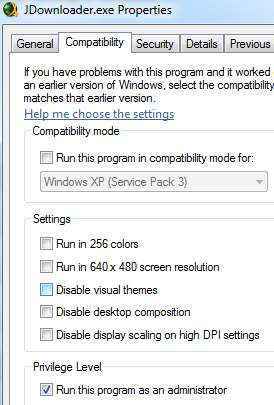 So, here’s the solution to get it running in Windows 7. 1. Goto Program files > JDownloader. 3. Goto the Compatibility tab > Privilege Level section, check Run this program as an administrator and press OK. Now you’ll always start JDownloader with Administrator privileges. 4. That’s it. Go and grab some rapidshare links to download with JDownloader. Or an alternative way would be to simplyturn off User Account Control (UAC) in Windows 7.